Do you need help with a Real Estate Contract in Florida. Our law firm has the expertise to advise you and assist you in achieving a positive outcome. A contract for the purchase of real estate is a legally binding agreement between a buyer and a seller agreeing to the transfer of the title to property. For a real estate contract to be enforceable, it must be in writing and contain all the necessary and essential elements to be considered valid. Short-term leases are often exceptions to this requirement. Competent parties are those who are of legal age when entering into the contract. If a party is declared insane by the court, he or she is considered incompetent. Anyone entering into a contract while temporarily mentally incompetent due to alcohol or drugs is also considered incompetent. Mutual assent is also known as a “meeting of the minds.” To have a mutual assent, there must be an offer and an acceptance. Legal consideration comes in many forms, such as real estate, money, services, or personal property. All parties to a contract must offer some type of consideration. A legal purpose is required for a contract to be enforceable. The purpose of the contract must be in compliance with the law. Illegal acts cannot be part of a contract. For example, if fraud is involved in a contract, it is not valid. The legal description should be used when providing the property description on the contract. The contract must include the purchase or sale price. The appraised value may also be used if it has a specified date. All parties must sign the contract. Partnerships and corporations may designate an authorized person to sign on behalf of the business. Electronic signatures are acceptable. It is important for real estate investors to understand the fundamentals of contract law, since contracts are an integral part of the real estate marketplace. 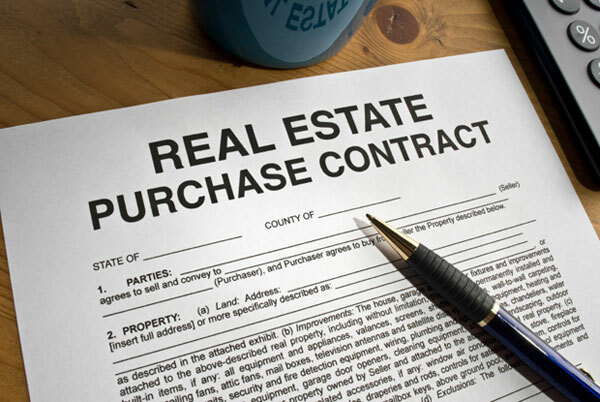 A real estate contract is based on common law principles. Initially, the contract is formed as an offer, which the buyer signs. Until the seller accepts the offer, the contract is not considered binding. An acceptance means the seller has agreed to the exact terms stipulated in the offer. If the seller replies that she or he will accept the offer, but then adds an additional requirement, the contract is not binding. It will then be considered a counteroffer. There must be a mutual agreement for a contract to work. If a time frame has been stipulated for an acceptance date by the buyer, and the offer has not been accepted by that time, there is no longer a contract. For example, the contract requires the seller to send a fax acknowledging acceptance. But instead, the seller calls or mails a letter. That is not acceptable per the terms of the agreed-upon contract. Unilateral Real Estate Contracts. Only one party is involved in making a promise concerning the contract. Bilateral Real Estate Contracts. Two or more parties are involved, allowing each to make promises to the other party. Expressed Contracts. They allow parties to state the terms of their contract in writing or verbally. Implied Contracts. They arise due to the intentions, relationship, or actions of the parties involved. Executory Contracts. Those contracts have not yet been completed because of unfinished obligations. For example, if a real estate transaction is in escrow, it is considered executory. Executed Contracts. They are complete; there is nothing more that needs fulfilling. Valid Contracts. They are legally binding and enforceable contracts where all parties are in agreement, and all the standards of contract law have been met. Void Contracts. Such contracts do not meet the criteria for contract law. This may be due to the contract containing illegal intent and therefore being unenforceable. Voided contracts are never valid, and neither party can enforce it. Voidable Contracts. They may appear to be legal but are lacking in their ability to meet some of the legal requirements. One or more parties can rescind the agreement as long as it’s done within a certain time frame. Enforceable Contracts. They meet the necessary contract law requirements and offer legal repercussions if it is not fulfilled. Unenforceable Contracts. They have the appearance of validity, but they offer no legal remedies if not fulfilled.